This past Sunday, I spent 4 1/2 hours operating on William Brillinger’s layout. What fun! You may recall I operated there once already, so this was round 2. After I arrived at Bill’s house at 1 PM, Bill offered me the choice of operating CN 532, stopped at Letellier, or a BNSF grain train from Noyes to Morris. For background, Bill is modeling the CN Letellier subdivision between Morris, Manitoba and the US-Canadian border at Emerson, plus the BNSF track between the border and Noyes, MN, with staging at both ends (track plan). Following Bill’s advice, I elected to take CN 532 while Bill took BNSF. After seeing what was on the train, I brought it forward into Emerson. Bill is modeling the border crossing procedure so his app covers the customs procedures required to obtain clearance to cross into the USA. You can follow that link to see the procedures. I used the app to “contact BNSF” and “request clearance”. It worked very well and seemed realistic to me. I had a bit of work to do before crossing the border. As I completed the crossing procedure, Bill was ready to cross the border into Canada with his train. We had to meet somewhere, so I pulled into one of the Emerson yard tracks and he passed by on his way north to Morris. Bill is visible in the distance, and I make a cameo as I checked to ensure the movement was able to clear the standing cars. Once I dropped my cars, I picked up the Canada-bound cars, did the brake test (also in the app) and executed the Canadian customs procedures to cross over. I did a bit of work in Emerson and then carried on to Letellier to switch the ADM Corn Processors plant (and the Agricore elevator) there. The ADM plant is a challenge to switch, as it has two tracks of tank cars with 5 spots each. The challenge is that the tank cars can’t just go in any location on the two tracks – each car may have a different product and products can only go in certain spots, so there is a lot of pulling and respotting cars. Once I finished there, I carried on to Morris as there was no more switching to be done. 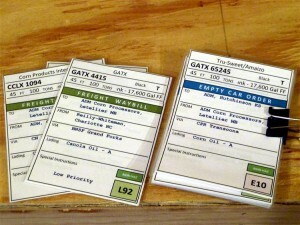 Bill uses car cards, like I do, although his system is a little different. The car cards he uses incorporate the “to” and “from” and other details, whereas I use a car card with a pocket that holds the “to” slip. On my layout I don’t track where they came from. Each car card also has a blocking code in the bottom right. This is a handy indicator to show where on the layout the car should go. In many cases the code indicates an off-layout (staging) location. Bill explains it here. After my pickup in Noyes and the switching in Letellier, the train was a jumbled mess. I had to do switching in Morris to block the train so that all of the blocking codes were together in the train. This took a fair amount of time and the challenge is increased because there are limited siding tracks in Morris and several crossings you have to blow the horn for. I confess I forgot to blow the horn a few times. Fortunately, no train-vehicle collisions occurred. Once the train was finally sorted, I ran around it to couple up to the head end and pulled it north out of Morris and into staging. Note I didn’t do the mandatory brake test… oops. Somewhere in the middle we broke for the traditional Allagash Lemon Cake with Bill’s wife and son. They are very tolerant of Bill’s train “play dates”… maybe because they get to eat cake too. After the operating session was over, I bought a couple of tank car kits from Bill, along with one of his Simple Switch Machines that I am eager to try out. I’ll write a review once I assemble it. 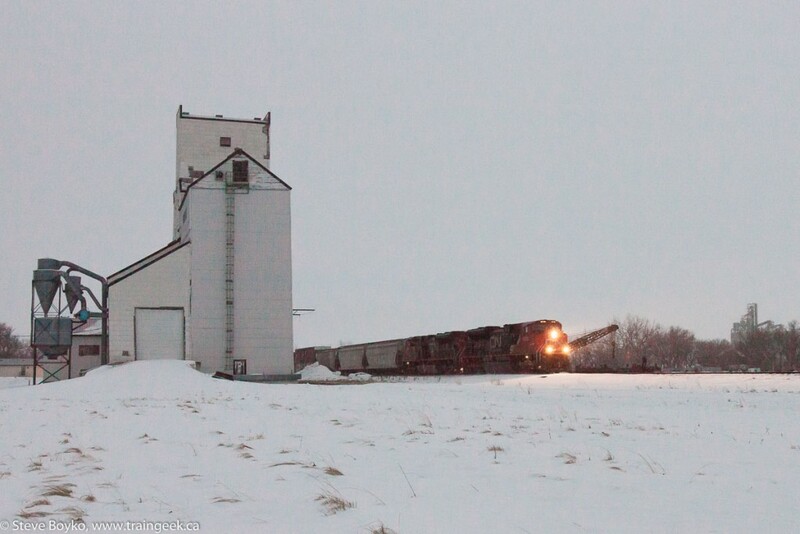 On my way home up highway 75, I encountered the 1:1 scale CN 533 just north of St. Jean-Baptiste, and I photographed it approaching Morris, and passing the older Paterson grain elevator in Morris itself. Thanks, Bill, for a great session and for inviting me to your layout again!